JOINING OUR CELEBRATION OF CHRIST’S BIRTH! The Rockford Community Nativity Display and Concert has been a yearly family friendly event since 2010. 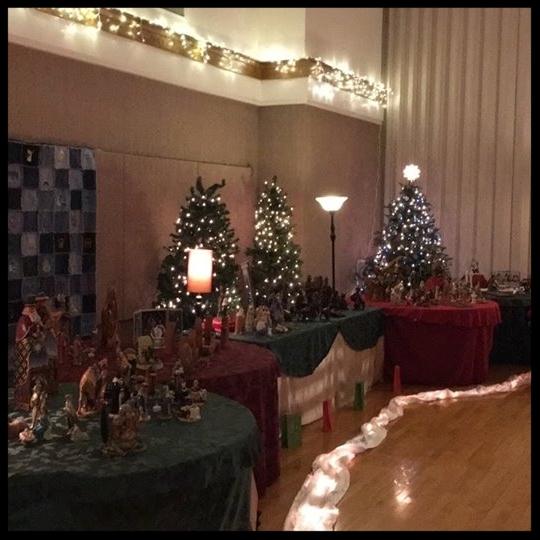 Over 300 Nativities are beautifully posed amidst a backdrop of Christmas trees, twinkling lights, Christ centered Christmas music performed live by area musicians, live musical vignettes, family activities, and free refreshments. The event is sponsored by Rockford Illinois Stake of The Church of Jesus Christ of Latter-day Saints. THANK YOU TO ALL THAT PARTICIPATED AND ATTENDED IN 2018!!!! MARK YOUR CALENDAR FOR 2019!! Check back for times and concert schedule! free admission - no goodWill offering. we will be collecting non-perishable items for the northern illinois food bank. Scenes from the first Act of the musical “Savior of the World” are performed every 15 minutes. The scenes have an amazing spiritual impact and depict events surrounding the Savior’s birth. Local performers provide Christ centered Christmas music during the entire event. Approximately 16 different vocal or instrumental groups will perform. Videos with musical performances from prior years are included on the Concert Schedule page. The event is VERY FAMILY friendly!! We provide activities that all ages will enjoy. Activities include story tellers, crafts, dress up, scavenger hunt, and FREE COOKIES! Each year we display over 300 nativities that volunteers spend numerous hours setting up in beautiful arrangements.